A “hachijurigoe” path is along National Route 289 that runs from Niigata City on the Sea of Japan to Iwaki City, Fukushima Prefecture. It once played an important role as one of the main horse and buggy routes from the Pacific Ocean to the Sea of the Japan, however, about a century ago, railroads and, later, newer roads for automobiles, made this path obsolete. 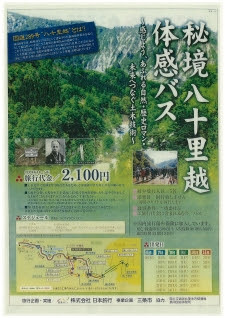 “Hachijurigoe” means that, though it is only about 20 kilometers long, it was such a rough and tumble route, people felt that they were actually traveling 300 kilometers. As it grew abandoned by normal traffic, the area became even more overgrown. 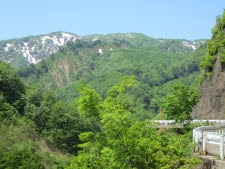 However, because of this, it became a popular nature trail for hikers, campers and mountain climbers. I was told as a child that a new highway along this route had long been planned as it was the shortest route between the two prefectures. In fact, going back 50 years, there have been many plans to pave the “hachijurigoe” path, but because of many factors, especially Japan’s economic ups and downs, these plans never came to fruition. However, recently, there has been a new push by the City of Sanjo to finally complete the project. Though it is still under construction in some areas, a limited number of bus tours began driving on the road on June 30 and will continue until November 9. However, it is too late to try and reserve a seat as, surprisingly, all the tours were fully booked in a short amount of time. For now, only a limited amount of traffic is allowed on the road, however, the long-awaited opening is well within sight. Many people in my hometown of Shitada Village believe that, thanks to this new highway, the local economy will prosper.